Pregnancy brings with it much excitement and great anticipation. You begin to feel inspired by the changes that will make your life better. It is a wonderful time for a woman to feel a life growing inside of her. Unfortunately, pregnancy can also be a time of discomfort and pain. Shifting weight, weakening tendons, sciatica, migraines, insomnia and so many more issues can cause stress that mothers-to-be don't need. The best pregnancy body pillow is designed specifically for pregnant women can relieve the pain and pressure. The marketplace is saturated with these pillows, which can leave a pregnant woman scratching her head with frustration. We have studied the best pillows on the market so you don't have to! Below is the list of the most popular pregnancy body pillows on the market today. Why Should You Buy a Pregnancy Pillow? 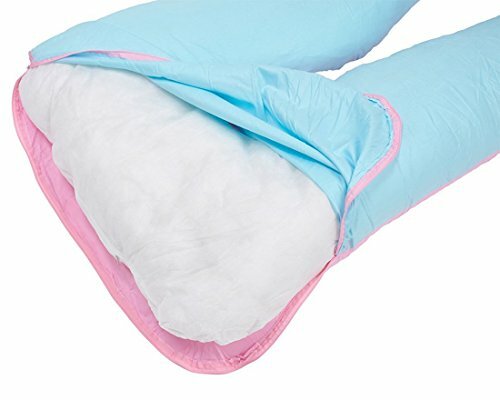 What Filling is Used in Pregnancy Pillow? Everyone knows a pregnant woman needs significant support while relaxing. Those needs change rapidly, almost daily. The Leachco Back 'N Belly Contoured Pillow grows with a woman's ever-changing body. It is designed to provide ample support for the stomach, back, hips and legs. Its contoured shape is versatile, offering a comfortable rest for women who are back, side or stomach sleepers. The contours of this pillow help to relieve nasal congestion, allowing pregnant women to get a good night's sleep. It is also an excellent choice for simply reading in bed. This versatility allows the pillow to be used beyond pregnancy as well. It makes an ideal nursing pillow, providing support for a woman's delicate postpartum body as well as her new baby. Why is this pillow the best? This pillow comes ready-to-use with a removable pillow case that can be machine washed and dried. Additional pillowcases are also available. The pillow itself is made of polyester. It is free of lead, BPAs, latex and phthalate. Leachco has proven they know what it takes to make a pregnant woman feel comfortable and get a good night's rest. We like the Leachco Back 'N Belly Contoured Pillow because it offers firm support for growing bellies and can be used well beyond pregnancy. Its versatile style makes it a suitable body pillow for all heights and sizes. It has shown itself to be suitable for pain relief and usable for nursing postpartum. As if that's not enough, this pillow has a low price point, making it an affordable option as well. No pregnancy is exactly the same, therefore it can be difficult to find pregnancy pillows that work for everyone. PharMeDoc comes close with its C-Shaped Full Body Pregnancy Pillow/Maternity & Nursing Support Cushion. Unlike some pillows, this one is flexible, which allows mothers-to-be to bend and twist the shape into whatever position they choose. The C-shape of this bed pillow supports all of the places on a pregnant woman's body that suffer from the most pain. It is an excellent choice for a sore back, tired legs, aching hips, bulging knees and tired necks. It can even be bent into a wedge shape to use between legs or under the head. The softness of this pillow makes it an ideal choice for those pregnant women who suffer migraines and need a soft yet supportive cushion. Do you need to know even more? The PharMeDoc full body pillow comes with a machine washable cover that is 100 percent cotton. We have found that this cover is much easier to remove and replace compared to other similar maternity pillows. The hypoallergenic pillow and its cover are resistant to dust mites. It also contains no phthalates, no BPAs, no lead and no latex. Pregnant mothers will never have to worry about their safety of the safety their unborn children when sleeping on this pillow. 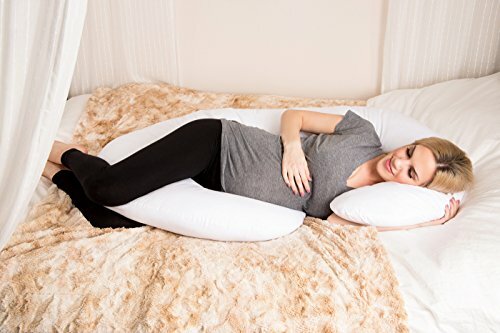 The C-Shaped Full Body Pregnancy Pillow/Maternity & Nursing Support Cushion is our favorite full body pillow because it offers versatility that is not found in many other pillows. 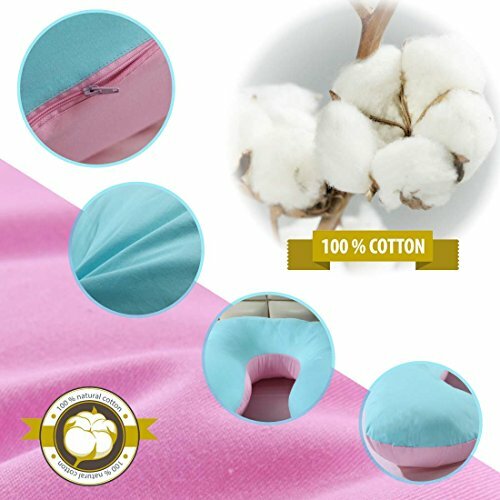 Its easy-to-remove and machine washable cover is a big plus, especially for those pregnant women who plan to use the pillow post-pregnancy for breastfeeding. We also recommend this pillow because of its 100 percent satisfaction guarantee. With a lifetime warranty, every pregnant body can be satisfied knowing that if any problems arise with the pillow, they can be swiftly dealt with. 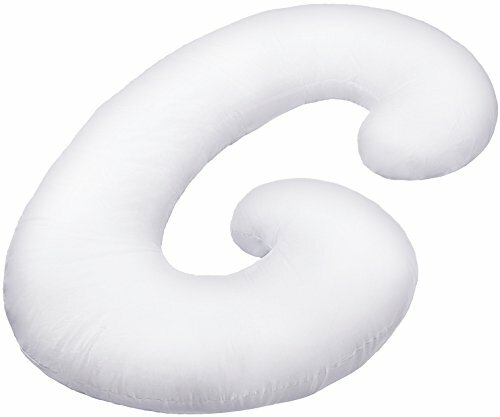 We think of the PharMeDoc C-Shaped Full Body Pregnancy Pillow as an investment that is well worth the money spent. The Web Linens U-Shaped Premium Contoured pillow is flexible and versatile. 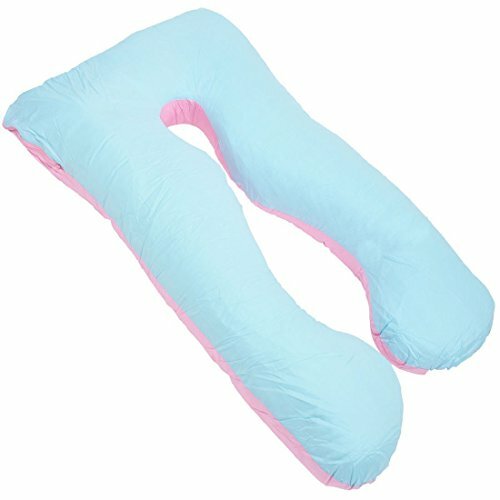 Women who wish to continue using their own pillow for head support can flip this full body pillow so that the opening is at their chest. They can still benefit from the side and back contours, and then use the base to prop up their feet. This is particularly useful for women with high blood pressure, swollen ankles and aching feet. This pillow comes with a removable, zippered protector. The polyester blend is made to replicate down, meaning the pillow is fluffy but not overly firm. This is perfect for those pregnant women who wish to use a pillow that offers light support and serious comfort. We love this U-Shaped pillow because it does all that it advertises and more. A pregnant woman expects this body to be for the full body, which it is. The Web Linens pillow provides comfort for those suffering from typical pregnancy aches, including sciatica, heartburn, nasal congestion and more. With a 30 day, no questions asked money back guarantee, this pillow simply cannot be beaten. It is also excellent at replicating down. That is important for those women who may have allergies to traditional down pillows. Those who enjoy light support from their fluffy pillows should give this one a try. We have found that the Queen Rose U-Shaped Pregnancy Body Pillow is the best on the market for hip pain. Its unique, ergonomic design is specifically made to support those joints that cause the most pain. It follows the contours of the body with a form that complements a woman's natural shape. What makes this pillow stand out from the others? Made from 100 percent cotton and polyester fiberfill, this pillow is super soft. That's not all. It is also very light. Weighing in at 5.6 pounds, the Queen Rose U-Shaped Pregnancy Body Pillow is one of the lightest on our list. This pillow comes with a removable, machine washable pillowcase. The zippered pillowcase is one of the easiest on our list to remove and replace. Women can also buy replacement pillow cases so they never have to go without the comfort of their pillow while the case is in the wash. The Queen Rose U-Shaped Pregnancy Body Pillow is the perfect ergonomic pillow for women with hip pain. The shape, size and material are ideal for relieving pain caused by loosening joints. We have picked this pillow as the top pain relieving because it helps to keep the spine aligned, which chiropractors know is vital to pain-free sleep. 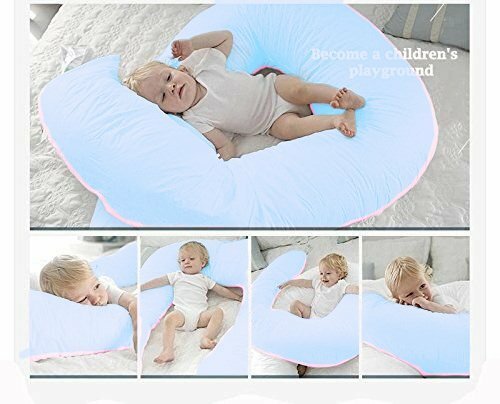 We also like this pillow because it is easy to remove its cotton case, it is light weight and transportable and it can be used well after delivery for comfortable nursing. The Comfort U Total Body Support Pillow is our top choice for body pillows for hot sleepers. It is stuffed with fusion fiber fill, a synthetic extended polymer filling that creates a better airflow through the material. This keeps body heat from being trapped in the filling and allows air to circulate, even while the pillow is in use. This pillow is perfect for women who are on bed rest. Allowing cool air to free flow throughout the pillow keeps it from flattening or becoming hot when a woman must use it throughout the day and night. In addition, the pillow is completely hypoallergenic. It is machine washable in a commercial size washer dryer and dries more quickly than most pregnancy pillows of this size. It also includes a washable pillow case made from a cotton/polyester blend. We love the Comfort U Total Body Support Pillow for its ability to turn the most restless sleeper's night upside down. It not only provides free airflow for hot sleepers but it is also contoured to provide back, belly, head, neck and leg support. Women who tend to be hot sleepers will find that they have never rested so well once they try the Comfort-U. Their partners will be thrilled as well! We highly recommend this pillow for anyone who wants a soft, supple cushion that does not absorb body heat. While other pregnancy pillows can be used as nursing pillows, the Naomi Home Cozy Body Pillow was built with postpartum use in mind. The firm support of the filling gives the new baby a perfect perch while nursing. Others may cause the baby to sink into the filling. That should never happen with this pillow. In addition, the contours of the U-shape design keep the nursing mother comfortable while she feeds her baby. She can enjoy the bonding time with her child without struggling to find a position that keeps them both happy and relaxed. A great pillow for postpartum days! The U-shape of the pillow has an inner curve that fits every body perfectly. It also has a gusseted neck and shoulder area that makes the transition from mattress to body pillow easier. We looked at many pregnancy body pillows to find the one that was best for nursing. The Naomi Home Cozy Body Pillow was our favorite, hands down. It offers firm support that is ideal for a new mother. It has cushions that cradle a newborn when nursing. 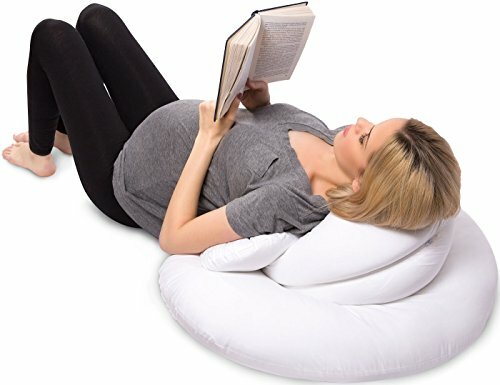 This pillow is comfortable enough to be used throughout pregnancy and beyond. It also has a machine washable pillow case, which means moms can continue using the pillow for as long as they like. The pillow cases are available in multiple colors, but we like the copper case as it fits with most decor. We chose the Leachco Snoogle Total Body Pregnancy Pillow as our favorite for multiple reasons. First, it is extremely comfortable. Filled with a poly/cotton blend, the Leachco Snoogle Total Body Pregnancy Pillow offers firm support while also being soft and supple. Second, the cover is made from a dreamy soft jersey. It is removable and machine washable as well. 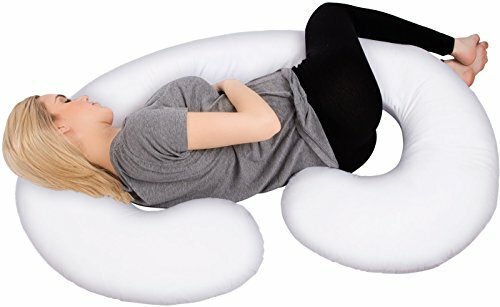 This snoogle is a good choice for women who need lighter support than a full body pillow but still needs something to help their aches and pains. It is a great choice for those who want a cushion that is still useful once the pregnancy ends. We love snoogles for the support they give during pregnancy. 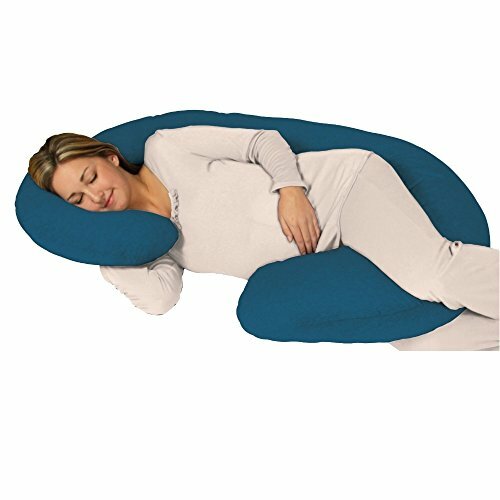 This snoogle provides perfect cushioning for sciatic pain while also offering comfort for the legs and neck. Our favorite feature of Leachco Snoogle Total Body Pregnancy Pillow is the machine washable jersey pillow case. Its super soft material makes falling asleep with this snoogle a breeze. 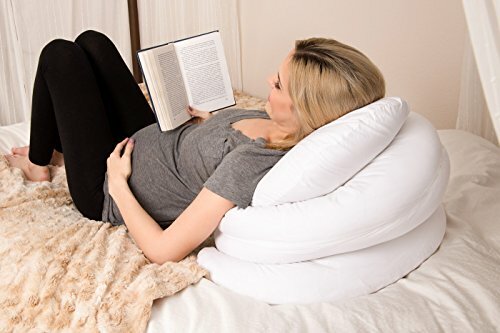 Today's Mom Cozy Comfort Pregnancy Pillow includes a unique shoulder comfort system. It was specifically developed to contour around the expecting mom's shoulders, offering soft, cloud-like cushioning where other body pillows provide hard edges and seams. In addition, the Cozy Comfort pillow utilizes a full-sized head rest that provides ample support to tired necks, backs, and heads. Can it get even better? Keeping reading! The benefits of the Cozy Comfort pillow do not stop at head, neck and shoulder support. 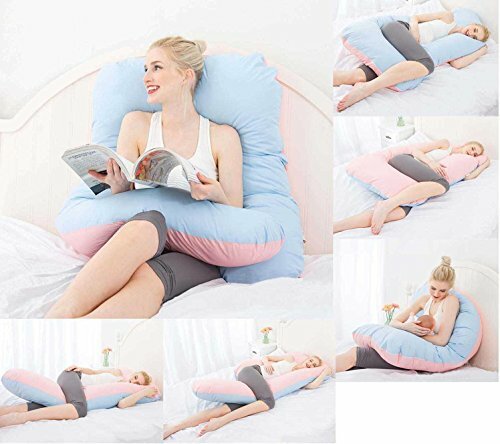 This full body pillow also provides support for the back, legs, feet and belly. Its ergonomic design means that users feel refreshed all over their bodies, not in one singular location. Few body pillows are made with the head, neck and shoulders in mind. Many women find that they must supplement their body pillows with additional cushions or wedges for adequate head and neck support. This is not true with Today's Mom Cozy Comfort Pregnancy Pillow. Those who suffer from head and neck pain can do no better than this amazing pillow. 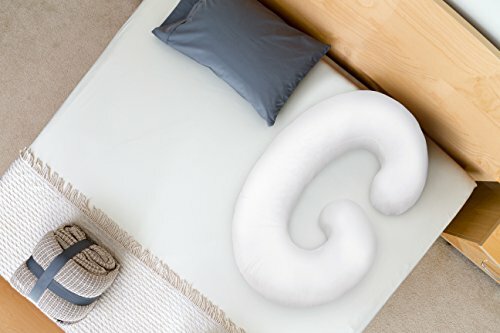 Cheer Collection offers three shapes of pregnancy pillows stuffed with alternative down: J, V and U. We tested each of these pillows and discovered that the Cheer Collection U shape is not only the best of the pillows, but it is also the best pillow money can buy for pregnancy-related sciatica. More than just sciatica relief! This pillow offers full body relief. The shape contours along the body, supporting the back and legs. When a pregnant woman wedges the pillow between her legs she will often find that her sciatic pain is lessened, sometimes completely. This allows for a restful night's sleep that otherwise may not be possible. 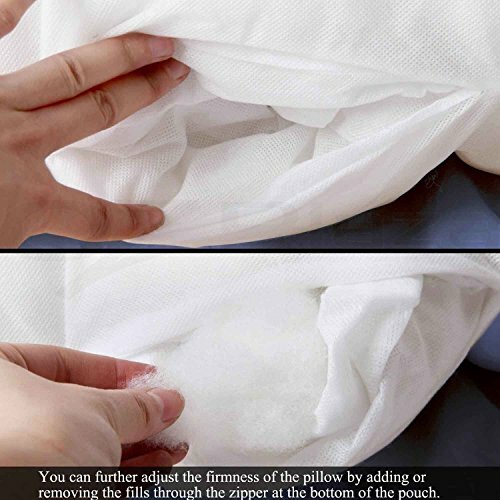 The pillow comes with a zippered cover that is machine washable. The cover is a cotton/poly blend that can be machine dried as well. The filling of the pillow is hypoallergenic, making it a perfect choice for allergy sufferers. We love the Cheer Collection U shape pillows for their soft, gentle support. This pillow is often used by those who suffer from back pain even if they are not pregnant. A person who suffers from sciatic pain or any other types of back or hip pain should seriously consider investing in this pillow. The Meiz Contoured Side Sleeping Body Pillow U-Shaped makes side sleeping a joy. The full body contour system allows a pregnant woman to use the pillow as they need. They can wedge one side between their legs, sleep with an arm under the head of the pillow or even double it up for an inclined rest. A pillow made by someone like you! The Meiz Contoured Side Sleeping Body Pillow was designed by a registered nurse and mother of five. She uniquely knows what the pregnant body needs and how to best comfort it. The pillow is fairly light weight but is long enough even for taller women. While it is flexible for use, it also offers medium/firm support. Basically, it is the best of both worlds! Post-pregnancy, this pillow is usable as back support when reading or watching television. The legs can be folded over the body to create an excellent nursing pillow. It also works well as an infant pillow when a baby is learning to sit. We love the Meiz Contoured Side Sleeping Body Pillow because it does everything a full body pillow should. It helps with body pain caused by pregnancy, aids insomnia and is very soft on the outside while remaining firm on the interior. Though there are many side sleepers available, we believe this is the best side sleeping pillow you can buy for your money. Large pillow may not be suitable for smaller beds. The various kinds of body pillows can be confusing. This is particularly true if you have never invested much time into buying a pillow or mattress. Understanding the terminology will help you decide which body pillow suits you best. The market is filled with pregnancy pillows, each claiming to be the best. While we have chosen what we believe are the best pillows out there, you may wish to do your own research as well. This starts with understanding what kinds of pregnancy pillows are available, what materials are used to make these pillows, whether you should purchase a firm or soft pregnancy pillow and other essential factors. We have put together a full pregnancy pillow guide to help you make the best decision possible. You will find out more about the different types of pillows and how each one can help you. You will also get tips on getting the best price on a pillow. Read on for a complete pregnancy pillow guide! Sometimes you will see pillows specifically described as maternity pillows. This is simply a general term for pillows and cushions that are designed for use during pregnancy. These pillows may be full body style. They might also be wedge cushions or pillows designed for a single body part. Often, the terms "pregnancy pillow" and "maternity pillow" are interchangeable when describing all pillows that are designed for pregnancy. A full body pillow is another general term to describe a pillow that extends the length of a person's body. These may vary greatly in size and shape. Standard full body pillows, also sometimes referred to as straight body pillows, are often simply larger versions of the typical pillow you sleep with at night. They may be long and rectangular. Sometimes they are slightly cylindrical. That's the main difference. The filling of a standard body pillow varies greatly. They can be either firm or soft. Some even offer a type of memory foam that can be placed in specific positions to offer unique support. This type of pillow is a good choice for people who like to snuggle up next to large cushion. Some pregnant women use them to support their growing bellies, but they rarely offer additional benefits for pregnancy. The one positive about these full body pillows is that they can be used by anyone whether they are pregnant or not. 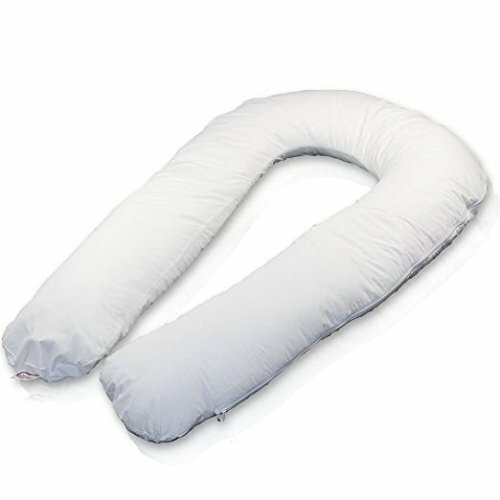 The U-shaped pregnancy pillow is arguably the most common and the best for pregnancy. These pillows offer support for back and stomach at the same time. They also have head support. This replaces the need for an additional pillow. For those who prefer to keep their standard pillows, most U-shaped body pillows can be turned upside down. You can then use its built-in head support to elevate your feet. Most U-shaped body pillows are also suitable for use during nursing. A Snoogle is the brand name of a specific type of pillow manufactured by LeachCo. The name has become synonymous with a type of pillow that is long and firm with a horseshoe-shaped head and a curved base for fitting between the knees. The Snoogle is an excellent choice for those side sleepers who do not toss and turn much at night. It is also good for propping yourself up when reading, nursing or watching television. It is not a good choice if you like to switch sides while sleeping. While the wedge is the smallest and least expensive option, it is also arguably the least helpful in that it can only support one part of your body at a time. It may be worthwhile to buy a pregnancy wedge in addition to a body pillow, but it should not be purchased in the place of one. Women who sleep on their stomachs are rarely able to get a good night's sleep when pregnant. We know a lot about this problem. If you sleep on your stomach, you might find that it is very uncomfortable to lie this way in early pregnancy. You will also find that it is impossible to lie on your stomach in your last trimester. While some women enjoy these pillows, many find that they are uncomfortable and cumbersome. It is best to try out a pillow for stomach sleepers prior to buying. One of the biggest complaints from pregnant women is being overheated. A hot, sweaty night can make a mother-to-be lose as much sleep as aches and pains. Many women do not like sleeping with fans, which can cause allergies to flare up. Likewise, she may not wish to turn up the air conditioning. This can cause high electricity bills and make others in the household uncomfortably cold. Cooling pillows can be great choices, but they seldom offer the comfort needed for a pregnant body. The best option for hot sleepers is to look for pregnancy pillows that offer cooling and/or have breathable filling. These pillows do not trap heat in like some others can. A pregnant woman's body releases a hormone called relaxin. This hormone causes tendons to relax, creating more space between joints. This is an important hormone because it allows a pregnant woman's body to grow without causing too much damage. Mainly, relaxin causes hips to widen, which is necessary during childbirth. Unfortunately, as the hips loosen, the mother-to-be also experiences significant pain. Few pregnant women escape the discomfort caused by relaxin. Pregnancy pillows with firm cushioning and the ability to be tucked between your legs are the best for hip pain. A C-shaped or U-shaped body pillow is the best option. Snoogles, which are a type of C-shaped body pillow, are also widely used for hip pain. Pregnancy only lasts a few months. You may believe you don't need a body pillow to get you through those long, sleepless nights until your baby arrives. You may even try to strategically stack pillows and blankets to help you sleep. 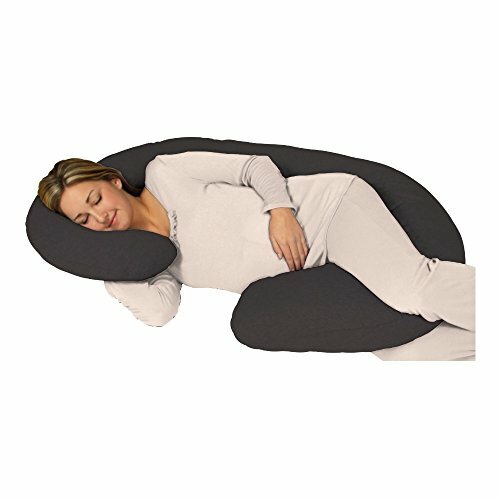 Why put your body through pain and exhaustion when a pregnancy body pillow can solve most of your problems? Sure, they may cost more than a standard pillow, but don't let sticker shock fool you. A pregnancy body pillow can save money in ways you may not imagine. The right pillow will keep you away from the chiropractor. It may even take the place of expensive massages. Once you are finally able to get a good night's rest, you may even find you are more productive at work as well. Are you ready for all the details? Short-term savings are not the only benefit of buying a pregnancy body pillow. The best pillows stand the tests of time. You can save the pillow for subsequent pregnancies. It can be used after surgeries or injuries. A good body pillow is a necessity for sore and tired muscles. Many people use body pillows on a nightly basis. You may find that your body pillow permanently replaces all of your bed pillows. You will immediately begin to feel results with the right body pillow. It can help your spine to become more properly aligned. A spine that is better aligned doesn't just improve daily aches and pains. You will also see an improvement in your posture. Poor posture can lead to long-term health concerns, including arthritis. Better posture also helps you to digest food better. Suffering from heartburn? A poorly aligned spine may be to blame. You may wonder how a body pillow can help your baby. The most obvious way a body pillow improves the health of your unborn child is through the lack of painkillers. Though most over-the-counter painkillers are not harmful to an unborn child, excessive use of them may be. If you find that you can no longer suffer through the excruciating pain of sciatica or tension headaches, you may find yourself using more painkillers than you would like. Using a body pillow may also help with delivery. Many midwives recommend the use of body wedges to ease and relax joints. This can make natural childbirth quicker and less painful. If you are planning on having a home birth, a body pillow is an absolute must-have. Some hospitals even recommend bringing your body pillow with you to the delivery room. The best way to feed your baby is through nursing. Unfortunately, especially for first-time mothers, nursing isn't always as easy as you might think. Some babies have difficulty latching. Some mothers find it difficult to hold their babies in a way that gives them the best access. This is where a body pillow can be extremely handy. Most of the body pillows are flexible enough to be folded into a bed rest. The legs of U-shaped body pillows can then be wrapped around your lap. This gives you a perfect perch for your child as he or she nurses. Another option is to nurse while you are both reclined. Using a body pillow as a source of support, you can nurse your baby while you both lie comfortably next to one another. We have done the hard work for you by compiling a list of body pillows that we think are the best. The easy option is for you to choose from this list based on the biggest concerns you have. However, you may find that you would like to explore the vast world of body pillows on your own. Following are some tips on how to find the best pregnancy body pillow. Do you have sciatica? Are you plagued with migraines? Do you toss and turn throughout the night? Are you on bed rest? There are some pillows that work well with multiple issues. There are others that focus specifically on your special needs. Pinpoint exactly what is most important to you before you even start looking. The size of your bed may help you determine which body pillow you choose. If you are in a full or double bed that you share with a partner, an extra-large body pillow may not be the best choice. Conversely, if you have a king bed with room to spare, your options may be unlimited. The best way to decide how large your pillow can be is to get out the measuring tape. Decide how much space your pillow can occupy and only look at pregnancy body pillows that fit within those constraints. Balancing your money is the key to having enough. No one claims that having a baby is cheap. Being pregnant means you suddenly have a number of new expenses. Unfortunately, those don't stop once the baby is born. You will have healthcare costs, new clothing, baby food, formula or nursing supplies, diapers, diapers and more diapers. The last thing you need is to go over your budget on a pregnancy body pillow. Online marketplaces, like Amazon, have some of the best deals in pregnancy body pillows. If shopping online, don't forget to consider shipping costs and possible taxes. Also, look into the cost of returns. Some sellers will not take returns under any circumstances. Others charge restocking fees or make you pay return shipping. One of the biggest mistakes new mothers make is buying used items to save a few dollars. While there are some used baby supplies that are excellent choices, like clothing and certain toys, others are a big no-no. You should never buy a used car seat as they may no longer be secure. Used cribs may not be up to current safety standard. Used pillows of any type should always be avoided for hygiene reasons. Though the outer cover a body pillow can usually be washed, the filling may have millions of germs trapped inside. It is important to know the different types of pregnancy pillows. Just as important are the materials used for making the pillow and its cover. Polyester or a polyester blend is the most common choice for all pillows, including pregnancy pillows. Some pillows may be made from 100 percent cotton. This is less important, as you are likely to have a cover or pillow case for your pillow. Pillow case material is vital when choosing a pregnancy pillow. It can be difficult to find substitute pillow cases due to each pillow's unique shape, so you must ensure that the protective cover that comes with the pregnancy pillow is suitable for your skin type. Many pregnant women develop skin sensitivities during pregnancy. Make sure your chosen pillow case does not interfere with your well-being. The best pillow cases are those made with 100 percent cotton. Look for a high thread count as well. Any pillow case with a thread count below 200 should not be considered. Indeed, the perfect one has thread count of 500 or more. If your chosen pillow does not come with a case that works for you, you may need to make your own. Filling can vary greatly from pillow to pillow. Most use a polyester filling, as many pregnant women cannot tolerate down. When looking at pregnancy pillows, pay close attention to the details of the filling, as not all are created equally. Polyester fiber filling creates a firm pillow that offers excellent support. However, it is also not breathable, which means it can absorb body heat, sometimes creating an uncomfortable atmosphere. Ball filling, which can be polyester or styrofoam, can be very comfortable. These can also create noise during the night. If you are a light sleeper, ball filling may not be your best option. Memory foam has become a very popular choice. Memory foam conforms to the shape of your body, growing with you throughout your pregnancy. Memory foam can be excellent for hip and back pain, but it may be too firm for some women. Natural filling, like wool or down, is less common. If you opt for a natural filling, it may be best to try one in person rather than purchasing online. Your pregnancy can alter your sensitivity to certain types of fiber. Natural fillings are generally the least tolerated by those with sensitive skin. There is no right or wrong when it comes to soft or firm pregnancy pillows. This is simply a matter of personal preference. You may want a fluffy pillow that comforts you in the night. You may want a firm pillow that supports you, giving you a painless sleeping experience. You might want something in between. What is most important is reading the details of your pillow so you know you are getting the right firmness. Look at the product description. Read reviews. Talk to people who have previously used these pillows. If you are buying online, you cannot test for yourself, so it may be worthwhile to only consider pillows that have return policies. A good option for you may be to test pillows in person. Once you have settled on the pillow you like, look online. You can often get a better deal on a pillow through an online marketplace than you can from a local store that pays commissions to its salespeople. Take your U-shaped pillow and make a “nest” on your bed. This will calm the baby and help him to fall asleep easily surrounded by cozy and soft walls. The second benefit is definitely feeding. And here is no matter what type you prefer: breastfeeding or formula feeding. Put the base of the pillow under your lower back and wrap the rest around your waist. That allows you to put the newborn on the soft surface and feed with no need to hold him in the arms for a long time. That will definitely prevent pain in your back and arms in future because your precious one is getting bigger and bigger each day! Relax and enjoy the little moments together! When buying a pregnancy body pillow, make sure that you purchase one with a removable outer cover that is machine washable. It may also be worthwhile to buy additional pillow cases for your body pillow. Because hygiene is such a big concern with pregnant women and newborns, consider buying a pillow that is dust resistant and hypoallergenic. Lastly, look for pillows that are free from lead, BPAs and phthalate for the best experience possible. We have studiedall the best pregnancy body pillows of all shapes and sizes. Our ultimate choice for the best pregnancy pillow is the Leachco Back 'N Belly Contoured Body Pillow. We think you will be happy with this pillow regardless of your needs. It offers a medium firmness, which provides support to most bodies, but is soft enough to allow you to sleep comfortably. It also has an affordable price point, which, I bet, is important for expecting women. We have no doubt that this pillow is the best choice for your money. Pregnancy Support Pillow is really great and helps pregnant women to sleep better by giving them the support and comfort they need. These are the Best Pregnancy Pillows that you can buy online. Thank you for sharing this wonderful and amazing Pillows detail.